4 1/4" x 3 1/4" x 1/2"
For those who find money clips appealing but desire a little more utility, this piece puts style and functionality at center stage. With seven pockets, you’ll be hard-pressed to run out of room with this money clip – nestled under the rear flap, six of those pockets offer a variety of storage options, with the remaining pocket on the front flap for quick access. The spring-loaded metal money clip also keeps your paper bills secure and easily accessible. But the first thing you’ll probably notice is our signature Nappa Vitello leather – extremely soft and smooth, this piece combines the smoothness of lambskin with the durability of cowhide. A thoughtful design coupled with a unique feel, this money clip should suit both your needs and taste. I first discovered this very practical money clip while walking around Pittsburgh airport sometime in the late eighties. Both me and my three sons since use this clip which needs to be replaced after some 6 to 8 years of constant use. Just recently I ordered a fresh batch for my sons. Many similar clips are in the market but non matching this greta product. A classic design continues, thankfully! I am now enjoying my third Bosca money clip wallet. Yes, they do wear out in time...a long time at that. I am guessing mine have lasted well over a dozen years each, so that would tell me that this design has been available at least 35-40 years. Thank goodness for that. I am willing to pay (now) $125 for this wonderful and so practical money clip wallet, which also provides ample pockets for your most critical cards and documents. 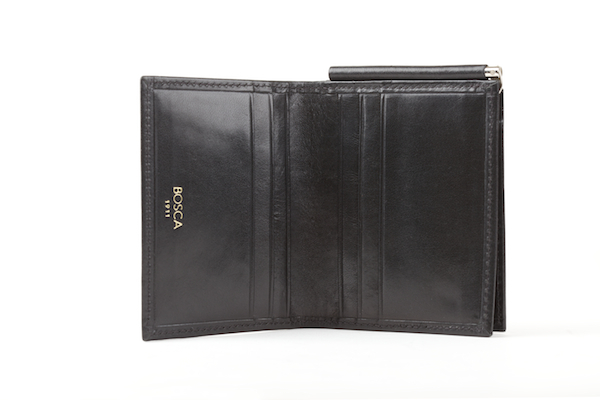 Thank you Bosca for your longevity and maintenance of the best designed and highest quality wallets on the market. The design of the Wallet/Money Clip is best in class. Once you use the wallet you will never purchase another style wallet. This is my third one in thirty plus years. I recommended one to my Son-in-Law and he agrees that this is the best wallet he has ever owned. They hold up extremely well and retain their beauty as they age. I have used this old leather money clip w/pocket for the last 30 years, back when they cost $25.00 dollars. My second one is still going strong. I will buy another one when ready. I love this wallet and it's style. So good it deserves repeating! Many men may not care much about wallet design and function; I am not one of them. I am very particular about the functionality of my wallet and many years ago I thought the BOSCA Money Clip/Pocket design might hit the "sweet spot" for me. It was spot on and served me with perfection for at least 15 years before it finally started wearing out. Please know that I always carried it in a back pocket so it got lots of wear. It was still intact but just wasn't looking too good. I liked it so much I decided to repeat the purchase and went to the Bosca web site and sure enough, it was still available. This longevity proved its popularity. I ordered my replacement and it came promptly and is outright beautiful, like everything Bosca makes. This is my fourth Bosca Wallet in 50+ years and although a bit "pricey" for some, the value is outstanding and the purchase is worth repeating. Great wallet. Small profile, holds many cards, & money clip is quickly accessible. I have been using these wallets for at least 20 years & will order another when necessary to replace. Good quality money clip wallet with ample card holders inside. Worth the investment. Should last me for life time. I like the detailed clip. Will be making more purchases in future. I received the wallet last week. I have Coach wallets and have used Bosca wallets in the past with good experience. I wanted a slimmer wallet the would be comfortable in my front pocket. My new wallet looks good and is working well for me. Bosca was quick to get it delivered to me in a very nice and professional package. Excellent purchase. WIth 6+ cards and cash the bill fold remains slim and rides comfortably in my back pocket. The leather holds up very well typical of all Bosca products and the metal clip works fine. Great craftsmanship. I being using these products for over 10 years. I give them as gifts. Outstanding quality, craftsmanship and design functionality which leads to exceptional product elegance! Thank you. This product exceeds all of my expectations. The simplicity of its design enables its authentic feel and functionality. years except for my bulldog. As rugged as it was my dog caused a comprimise Thanks for producing an outstanding product . After my last wallet was stolen I knew I needed to get a new one ASAP so that I wouldn't lose any cards from being loose in my pocket. I was hesitant to spend over $100 on a wallet, but I really wanted something that was small enough to fit in my front pocket (so that it was less likely to get stolen again) and made of nice leather. This was by far the best wallet I found that fit the bill. I didn't know if I would like the reddish shade of the cognac leather, but I ended up really loving it. The money clip is well built and I have confidence that it will last years to come. Overall it's without a doubt my favorite wallet I've ever had since I was a kid, and if I lost it I will gladly shell out $100 for another one. Your wallet is something that you're going to use and interact with every day, and it's definitely worth splurging a little on. The only thing that would make it better is making it RFID blocking, but that's a minor thing for me. Really a great wallet. Exactly what I was looking for. I replaced a money clip/card holder that I had used for years. This wallet holds more cards and is still compact. Money clip is a nice design. Leather is top quality. Hope to get as many years of service. Love this money clip! Bought for hubby for 2 anniversary with initials in cognac- he loved it! Makes me smile every time I see him pull it out. Thanks guys! I originally purchased the Nappa Vitello model but exchanged it for the Old Leather in cognac. It has a more sophisticated look with the same practical functionality. 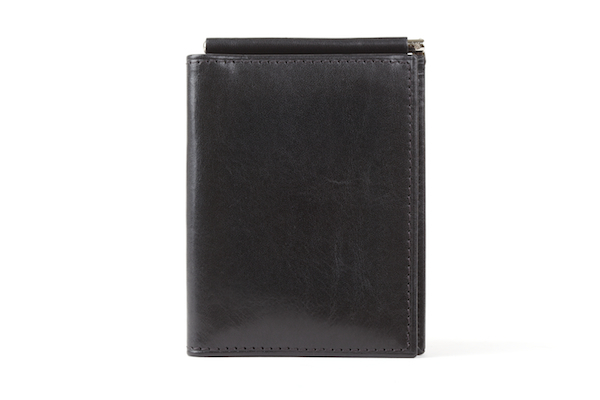 The black edges against the cognac leather give it a sharp look and the money clip adds an elegant touch. The money clip flap pocket is perfect for receipts or movie tickets and the clip securely holds paper currency. There are plenty of slots for cards without the bulk. Overall this is a stylish and unique option for a slim wallet that looks sharp and is very functional. It's got enough room for the important stuff without the extra junk. Give this wallet a try. You won't be disappointed. The inside facing credit card slots keep your cards secure, as they won't be able to creep out. I've lost a metro card from a non-Bosca wallet where the card slots face an outside edge. The quality of the leather and craftsmanship is very high. I would recommend this wallet. A wallet is not just a wallet. After receiving my Bosca I was amazed at the quality of craftsmanship. A top notch product all around! This is the third Bosca money clip wallet that I have had. Each one has lasted over five years. The quality is excellent and this one is no exception. This wallet combines the thinness of a money clip with adequate card holding capacity (6), including room for loose biz cards and misc receipts...in an efficient and relatively flat, slim format that slips into my front pocket. I have literally looked for years for this style and have not found it anywhere. So I finely looked at the wallet itself, got enough of the worn down brand name to find online and voila! within a week I had a monogrammed version just as my old one fell apart. Outstanding design. Outstanding quality (that wallet lasted me....20 years? More?) and Outstanding service. At my age, could be the last wallet I will need...but if I were buying a gift or asked to recommend a wallet...the Bosca Old Leather Money Clip w/Pocket would be it!! Does everything I want and at the perfect size. It's great on the hand and eye too! Just perfect!! My husband has one of these wallets that is in great shape. I bought this one to put away for a future gift in case Bosca stopped making this design. I love this wallet! I have owned this wallet before and it lasted for many years. I was glad to see that they were still carrying it after all these years. VERY HIGH QUALITY! You will love this wallet. Quality provides lasting value. I am on my second Old Leather wallet. The first one was purchased a couple of decades ago at a local department store and I loved it. My local store no longer carries Bosca, so I contacted customer service and purchased a second one about 10 years ago. My 10 year old wallet is a little worn but still in great shape even with being overstuffed with cards for years. I think I will have another 10 years on this one. I hope Bosca will still have the Old Leather line in 2024! I have used this type of wallet for at least 15 years. They are durable, soft high quality leather, very well designed and excellent priced. I’ve been searching for a long time now for a money clip style wallet that I could keep in my front pocket but with some added capacity from what I’ve been able to find. This wallet hits a home run in all aspects. The spring clip allows for easy access of bills but still maintaining the right amount of tension so all the remaining bills don’t slide out. 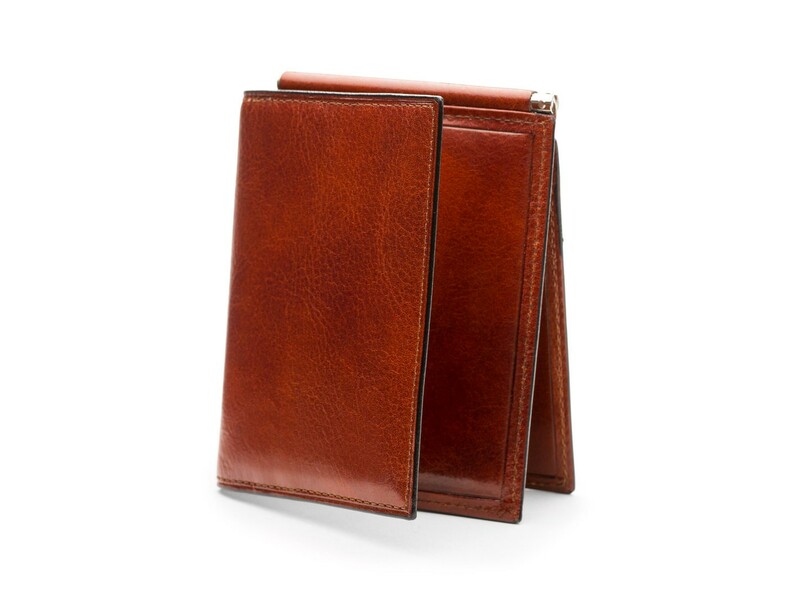 The wallet still remains slim even with all the card pockets in use and the Cognac color is simply stunning. An elegant design beautifully executed. Exceeded My Expectation...and that is hard to do! I searched local department stores as well as the internet, for a high-quality wallet that featured a money clip (the only item on my boyfriends Christmas list). He loves money clips, but as far as I was concerned, he was desperately in need of a normal wallet as well. After weeks of looking, I finally ran across this site and found exactly what I was looking for. A wallet/money clip combo that I was able to monogram...perfection! The quality of the leather and the functionality exceeded my expectations, and his as well! Good product but definitely not for front pocket. Too big. good room for money and cards. excellent for travel. Bosca is the absolute best in leather goods. Bosca Old Leather Classic items are the epitome of beauty and durability. Decades ago, my father's wallet and keycase were the first examples I saw of Bosca's excellent craftsmanship. Now my husband and our sons all enjoy Bosca's innovative, top quality products. Our younger son likes the minimal yet private and secure features of the Money Clip with Pocket. If you want to give someone the very best, choose a Bosca gift! I have had several Bosca products in the past and after trying others, always come back to them. This particular wallet is a little large for my front pocket but would not hesitate to recommend it to others. I will be getting another money clip from them. Bought for my husband for his birthday. He likes the old fashioned money clip wallet and the front pocket wallets. I had a hard time finding a nice leather one. The money clips aren't as popular as they used to be making them harder to find, especially a quality one of fine leather. I looked at several of the top retailers. This one did the trick. He loves it and it is such soft leather! Have had this same wallet for 20 years, or actually the same style since had worn out a few times due to constant use. Expect to stay with the style forever.